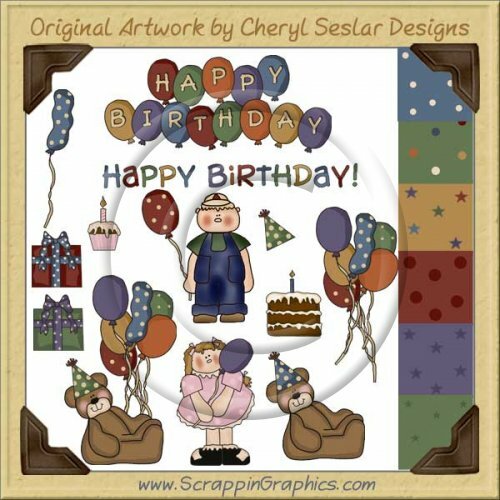 This instant download will add that festive touch to any birthday project. This set includes 19 different graphics: 6 coordinating backgrounds (white dots on blue, multicolored dots on green, green stars, purple stars, red dots, multicolored stars on yellow), blue deflated balloon, bunch of balloons, HAPPY BIRTHDAY balloon word art, teddy bear holding balloons, birthday teddy bear, birthday boy, birthday girl, birthday cake, pink cupcake with candle, green gift, red gift, HAPPY BIRTHDAY word art, green party hat. Great for making first birthday scrapbook pages, invitations, party items and other printables.